Oh, wow - it's finally Saturday! I don't think I've been this happy to get to a weekend since the Saturday after the last day of school in June. My head has just been spinning this week with all the activities and commitments of back to school week. I kind of feel like Linda Blair in that Exorcist movie - minus the pea soup - but wow, way twisted around. Good news is that today, I have 6 uninterrupted hours of ALONE time at home, in the studio so I can work on a tutorial for a special Holiday publication. Don't worry, if you are one of my faithful you'll get to see it - promise! 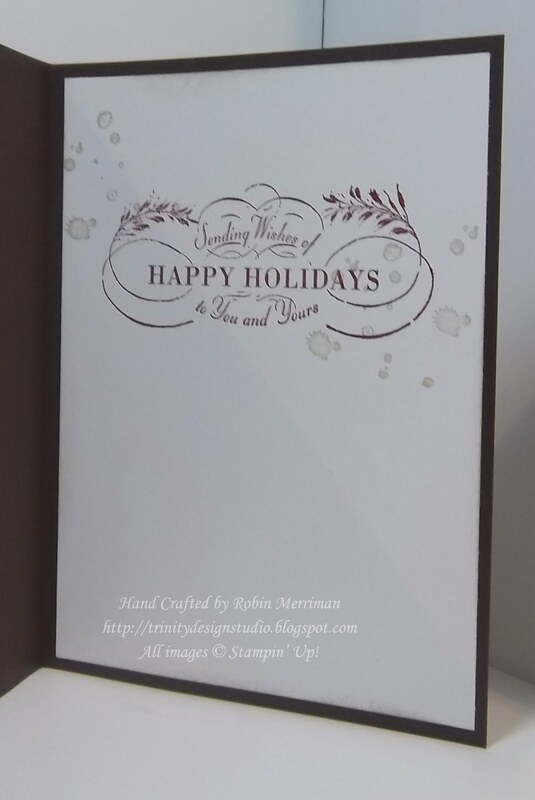 I recently participated in 3 card swaps for the awesome Holiday Mini Catalog. This is the card I did for my good friend Tara's swap. The Christmas Lodge stamp set is one of my absolute favorites from the Mini - you'll be seeing a lot of it, so just buckle in for the ride! The beautiful evergreen tree image reminds me of the HUGE evergreen tree that used to grow beside my Grandma's house. It was immense, not just by little girl standards, but really, IMMENSE. She used to get so irritated at all the pine cones it produced, but it's funny, in later years, my Mom and I loved to decorate with them. Since my Grandma was gone by then we had to resort to picking pine cones up from a field across from their house at the river. We were probably trespassing, but no one ever came looking for those pine cones so I think we got away with it! For this card, I tried to keep it simple, really, I tried. I did succeed in keeping it relatively flat - that's a toughie for me because you know how I love my embellishments. But I keep hearing from folks who want or need flatter cards because of the pickiness of our postal service. I still say it's worth a few extra pennies to send a heartfelt, handmade greeting to someone. But I digress - again. The card base is Early Espresso card stock. 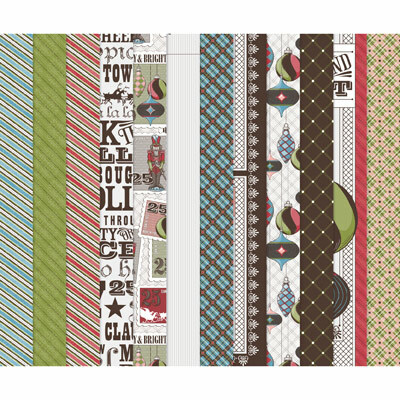 The Designer Paper peeking out from the left corner is from the Letters to Santa pack - a must have in my opinion. 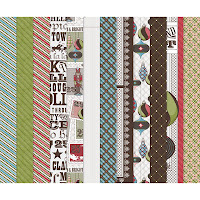 It has designs in it that would be great for year round projects, not just Christmas. The top layer is Very Vanilla card stock. I stamped the evergreen tree image in Always Artichoke Classic Ink. The greeting is stamped with Versamark Ink and heat embossed with my Heat Tool and the yummy Cherry Cobbler Embossing Powder. I overstamped everything with the rain spots image from the French Foliage stamp set using Crumb Cake Classic Ink. 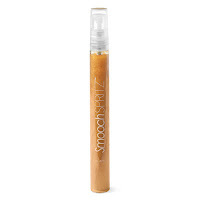 Then I used my Gold Smooch Spray and spritzed the card front. This layer was torn and then sponged with Crumb Cake Classic Ink to age it a bit and then I added the Cherry Cobbler Seam Binding ribbon and bow at the top. 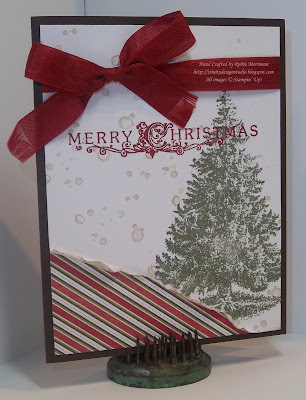 A few more Crumb Cake rain spots stamped inside and overstamped with the greeting in Cherry Cobbler Classic Ink. Nice, simple card, eh? Yep! 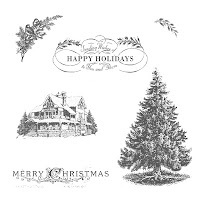 So, I know you NEED that Christmas Lodge stamp set - isn't it gorgeous? All you have to do is visit my Online Stampin' Store. It's open 24/7 and you can shop in your pj's or your prom dress - it's that simple! Have a great Saturday - I hope you find time to stamp something fun! 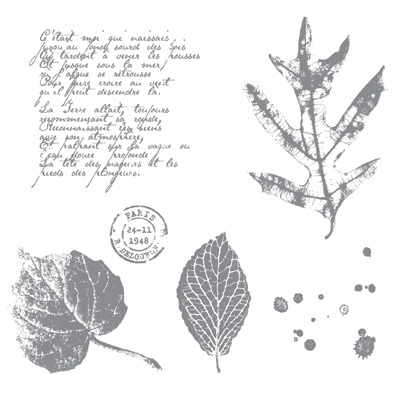 Love this stamp set and the beautiful card you created with it! Great Christmas and swap card. One to CASE for sure. My Christmas Lodge set just arrived ....a lovely gift from SU for the convention recruiting special, whoo hoo! Can't wait to start stamping with it.